We at Innovative Surfaces of Texas, Inc. (IST, Inc.) want to be your 1st choice for all of your decorative concrete needs! Thank you for visiting our website we look forward to working with you in the near future! 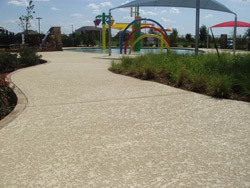 IST, Inc. pledges an outstanding customer experience utilizing the diligence of our crews, the ingenuity of our project managers, and the creativity of you our customer resulting in a uniquely beautiful decorative concrete finish to showcase and take pride in for years to come! "Let us surround you with elegance"
Innovative Surfaces of Texas, Inc. works throughout the Dallas/Fort Worth metroplex including: Arlington, Dallas, Fort Worth, Grand Prairie, Denton, Rockwall, Weatherford, Waco, Temple, Austin, Tyler, Longview, Southlake, McKinney, and other regions of north, central, and west Texas, northern Louisiana, and Southern Arkansas.